Spice up your Halloween celebration with some roasted pumpkin seeds! 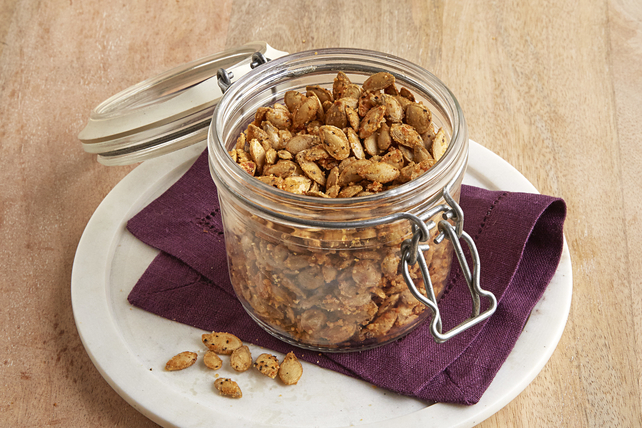 These easy Savoury Roasted Pumpkin Seeds are even perfect for a midday snack. Toss pumpkin seeds with butter in medium bowl; stir in remaining ingredients. Bake 25 to 30 min. or until seeds are crisp and lightly browned. These flavourful pumpkin seeds can be prepared ahead of time. Cool, then store in airtight container at room temperature up to 1 week before serving.